We were given the gift of a random free Saturday a few weeks ago, so of course we all agreed that a walk to the farmer’s market was in order and we needed to turn the day into ‘project pie’. The girls and I found this recipe in Allison Kave’s book, ‘First Prize Pies’, and it definitely made our day. In season, ripe fruit is incredibly juicy however, so I changed the recipe only to allow the plums to macerate so that I could reduce their juices – enjoy! To peel plums, slice a small, shallow ‘X’ into the bottom of each one and then plunge them into a bowl of boiling water for several seconds before quickly submerging them in a bowl of iced water. I found that with a sharp knife, they peeled very easily, very similar to peaches! In a large bowl, toss together the plums, honey and vanilla, then set them aside and allow them to macerate for about 30 minutes. Give the plums another good stir and then drain them through a colander (into another bowl), reserving the juice. 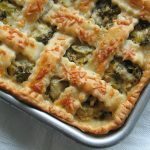 Either in the microwave or in a small pot on the stove, simmer the juices with the butter until they are reduced by at least half and start getting the pastry ready. 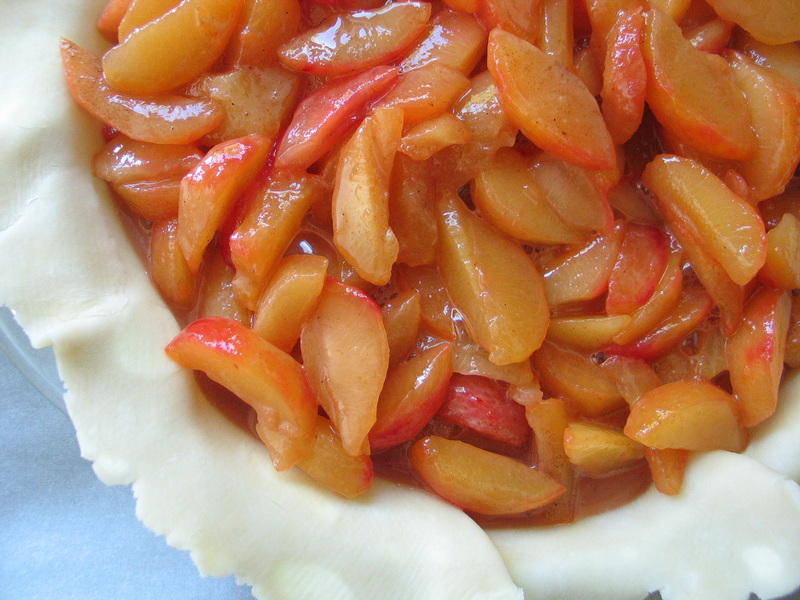 Once the juices are reduced and your first sheet of pastry is lining the pie plate, toss the plums with the brown sugar, cornstarch, salt and cardamom and then scrape this whole fruit mix into your prepared crust. Drizzle the reduced juices evenly over the plums, and then cover with the second sheet of pastry, dampen, trim and flute the edges and cut a couple of air vents into the top. Brush the crust with beaten egg, and then carefully sprinkle with the sugar. Your pie will be full – I would recommend baking it on a baking sheet covered with parchment. I baked this at 450 for 10 minutes and then covered the edges with foil, or an ‘edge protector’, and turned the heat down to 350 and baked it for another 40 minutes. Allow the pie to cool completely before serving (and if, by chance, there’s any left over…enjoy it with some scrambled eggs for Sunday breakfast! ).